Lightgliders: Picture Scavenger Hunt Party! This Thursday! Picture Scavenger Hunt Party! This Thursday! It's time to go on an Adventure! Get ready to glide for this Party because we will be taking you all around the Academy on our Picture Scavenger Hunt! We will begin the adventure in the Courtyard at the Fountain, where our trusty map will show us which spot in the Academy to go and take our first group picture! We want to snap a photo at each location and at the end have an awesome memory book of this awesome party! 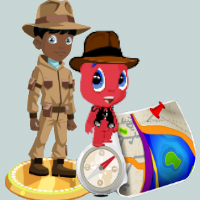 So make sure you do your Gliddle Challenge of The Day to get your Adventure Outfit and meet us in the game this Thursday at 5:30pm EST/4:30pm CST. See you soon! Glide on! This sounds so fun! I love adventures! Thanks Sarah! We hope to see you Thursday!